Our Film Sponsorship program benefits the theater, community and independent film while building goodwill for your organization. Film sponsorships are $300 and include 45 tickets to the movie during its run (a $360 value) which you can pass out to whomever you wish (customers, students, employees, friends, family, etc) - in addition to marquee, website, film schedule and social media recognition. We also invite our film sponsors to set up a table in our lobby during the film's run (which we provide) to display products or provide marketing materials to distribute. Please contact us using the form below us to discuss packages for sponsoring a single film or multiple movies. STILL ADS - Your supplied image will show multiple times on our pre-roll before every film in both theaters for the contract period. Rates: $100 per month or $250 for three months. Specs: High quality image in JPEG or PNG format, Resolution 1280 x 800 pixels, 16:9 aspect ratio. VIDEO ADS - Your supplied video will show once prior to each film in both theaters for the contract period. Rates: $150 per month or $350 for three months for up to a 30 second commercial. $200 for one month and $450 for three months for a 31-60 second commercial. Specs: 1920 x 1080 or 1280 x 720, video format .MOV (or equal). The deadline for ads and payment is the 25th of the month for ads to begin the 1st of the next month. 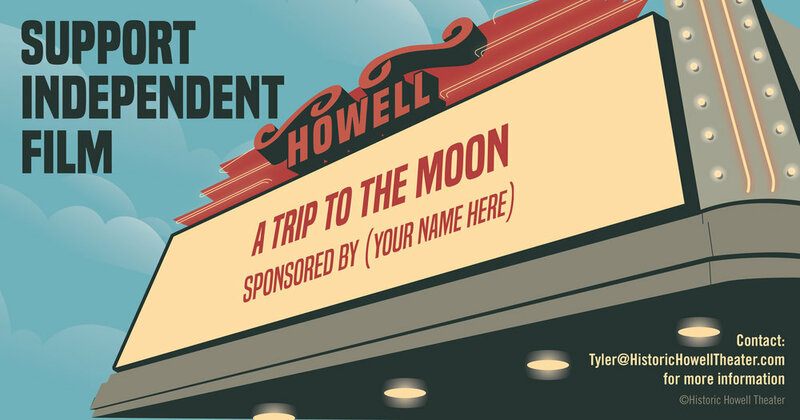 Contact us about sponsoring a film or advertising your business at the Historic Howell Theater.